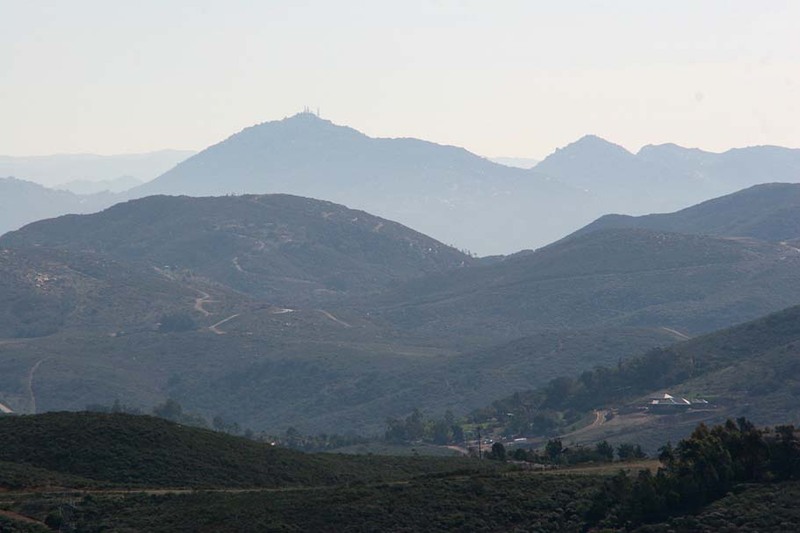 The Rancho La Costa Preserve is a the small mountain open space located near where the communities of Carlsbad, Encinitas, San Marcos, and Olivehain converge in coastal north county San Diego. While this is not a destination per se, it is certainly a gem of a neighborhood trail. With maybe six miles of trails here, what this place lacks in mileage in makes up for with "smileage". While in nearly all directions you can see the besiegment of this mountain by urban development, I always seem to feel like I have escaped to high ground above it all in this small fortress of singletrack. 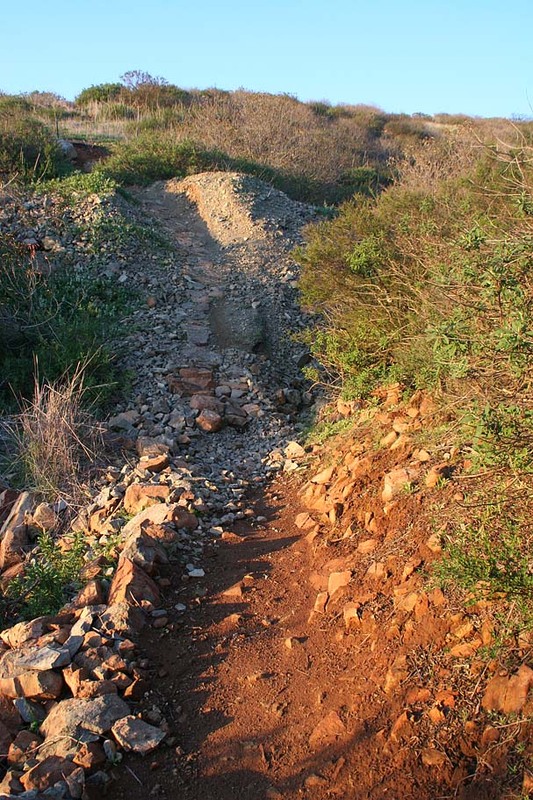 While most of the trails are semi-buff single tracks with a few rocky areas, there is one trail dubbed "NASCAR" that will be challenging for most intermediate riders on cross-country and all-mountain bikes. 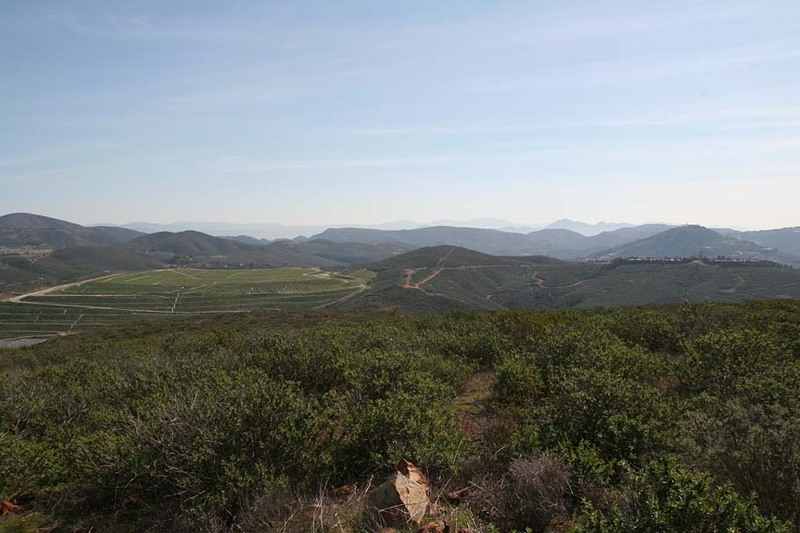 Bit of History: You may also hear this area referred to as Denk Mountain which comes from the Denk Family ownership of most of the mountain for nearly all of the 1900s. Copper was also mined from this mountain in the early 1900s by the Encintas Mining company. There were three vertical shafts that we over 300 feet long and a single horizontal shaft that was over 200 feet long. The shafts have long since been blasted in for safety reasons but you can still find evidence of the mining activity at various spots on the mountain. 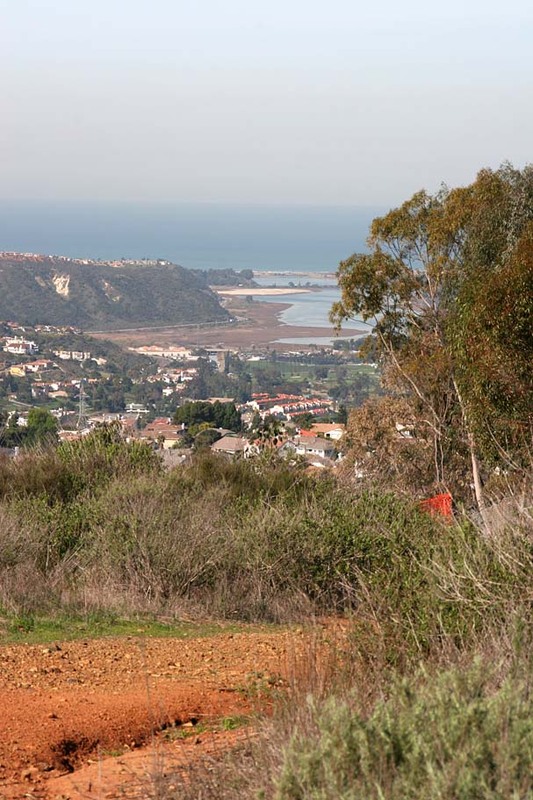 Both the NASCAR and Vista Del Mar trails take you out to and over two of these tailings piles from that mining era. You know you are there when the trail suddenly becomes scree rocks with a slight greenish tint. From downtown San Diego: Travel North on I-5 for about 26 miles. Take the Leucadia Blvd exit and turn right. After 1.7 miles Leucadia blvd becomes Olivehain Rd. After .9 miles Olivehain Rd becomes Rancho Santa Fe Road. After 1.8 miles turn right onto Camino Junipero. At your first left turn onto Corte Romero and on the street alongside the green belt area. From Orange County: After passing through Carlsbad while going south on I-5 take the La Costa Ave exit and turn left. Take La Costa Ave 4.1 miles and turn left onto Rancho Santa Fe Rd.After .7 miles turn right onto Camino Junipero. At your first left turn onto Corte Romero and on the street alongside the green belt area. Here is a map of the area. Of the three electronic data file below, the Google Earth file contains the most data. The others contain just a common loop. While this advice is good on any trail, it is extremely important on this system. Please remember to be good stewards here. 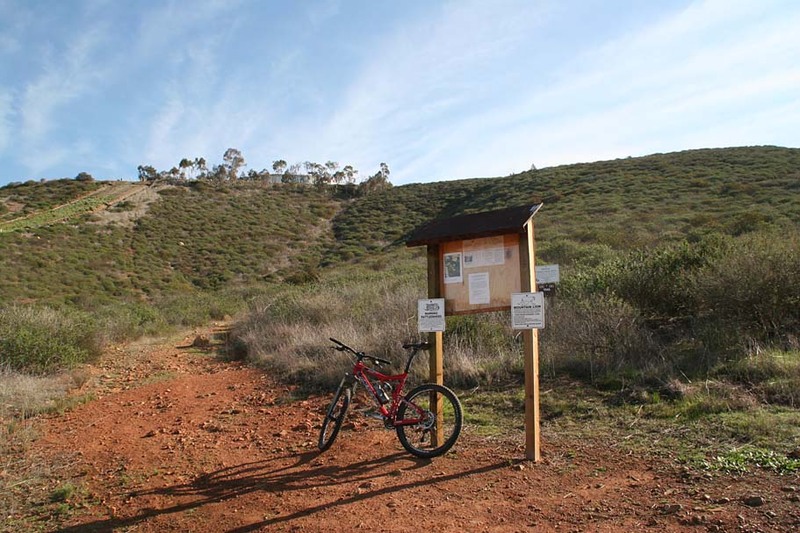 The local mountain biking trail advocates have culitivated great relationships with the land managers here. It is literally a case of allies where there once was foes. Please respect all trail signs. Don't cut the switchbacks or make go arounds. This is not the only parcel these land managers take care so being selfish here could undermine efforts much bigger than a switchback or two that you may not like. 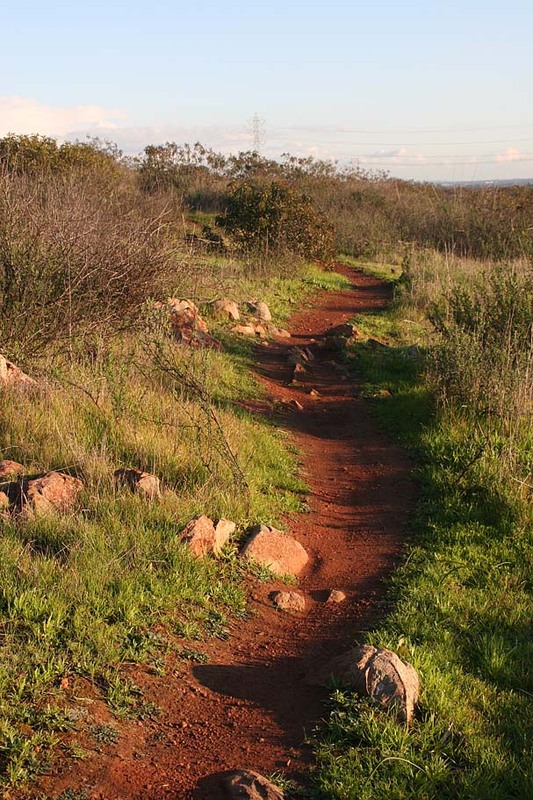 General advice for hikers and trail runners: If you are looking for the most direct route to the top of the mountain, you should take the Mule Deer Trail. 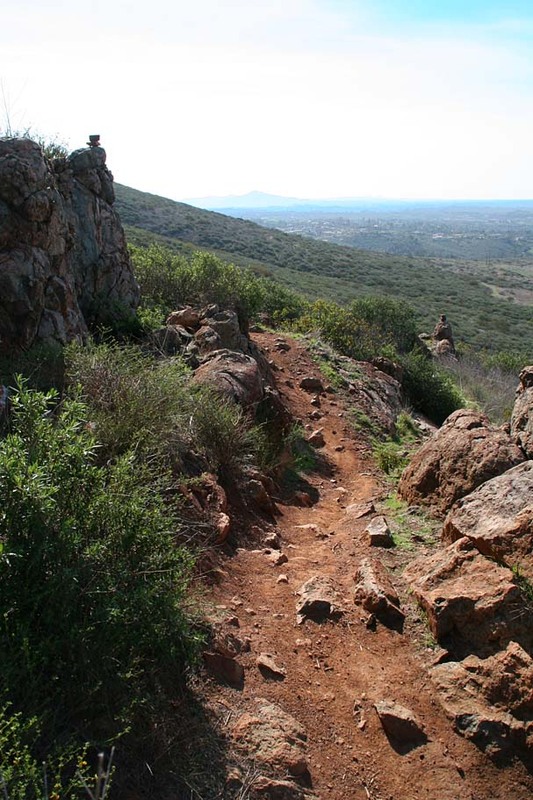 The Switchbacks or Vista Del Mar trails are much longer and quite mild. There are spots along the Switchbacks trail where you can see the trail further up the hill. Please do not cut over to the trail further up the hill. 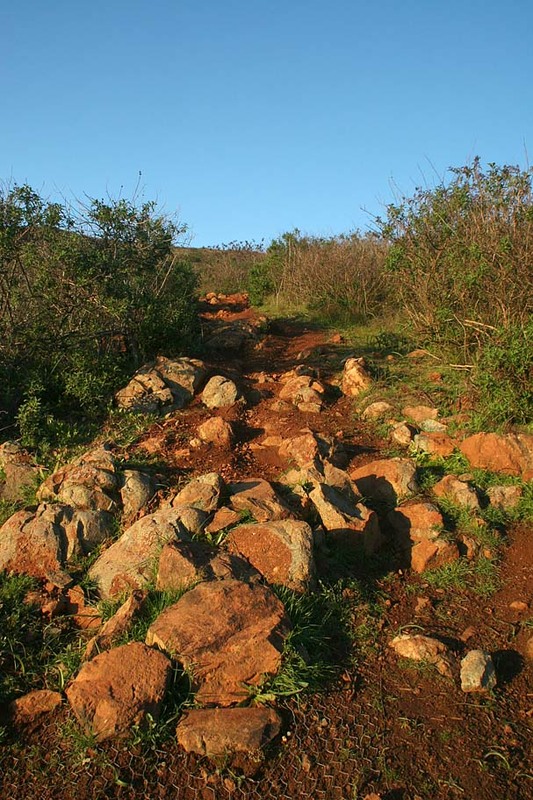 Short and steep or long and mild, whichever route you select please stay on the trail. General advice for mountainbikers: This is not a Flightline area and freelance trail building or stunt construction will not be tolerated. 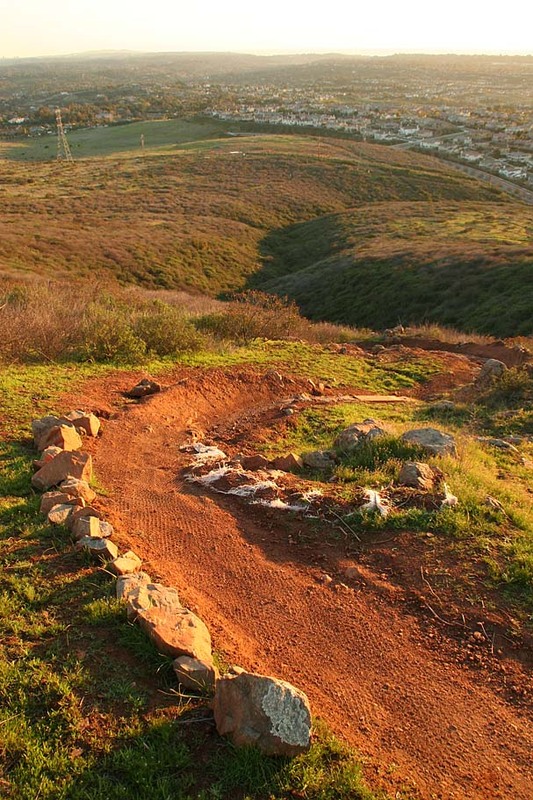 If you want to help build trails, please contact the San Diego Mountain Bike Association to get plugged in. They will be more than happy to channel your trail building energy in the proper direction. From the parking area in the great belt at the corner of Corte Romero and Camino Junipero travel up Corte Romero for maybe 100 yards and turn right onto Sitio Salvia. Travel maybe another 100 yards and then turn right onto a fireroad to get into the area. After going around a normally closed gate you will come to a T-junction. Turn right and travel uphill where you will soon go by the bottom of the Mule Deer Trail and a kiosk. Stay straight onto the switchbacks trail. Over the next mile you will gradually climb as the switchback trail folds back nearly onto self numerous times as it takes the long meandering way up Denk Mountain (Personally I think Mountain is a far stretch here). 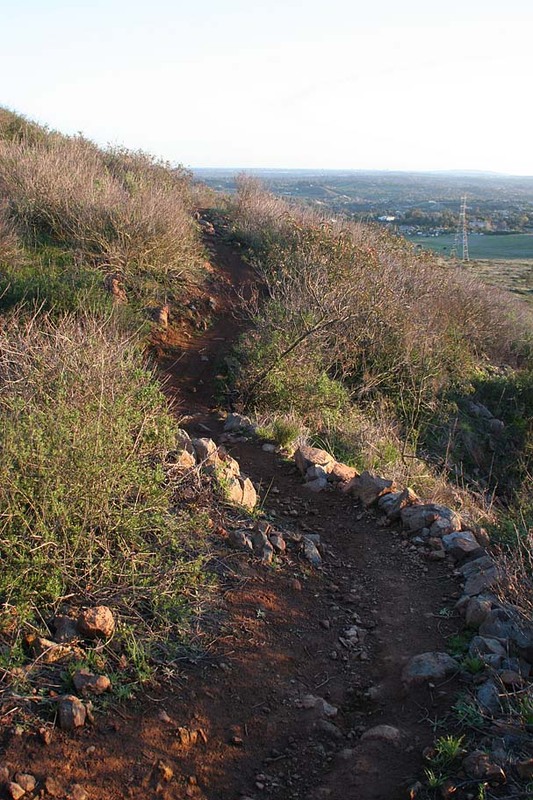 Most of the small rock features in the trail are found in the wide rolling switchbacks. You will cross over the Mule Deer Trail once during the climb and it will be quite obivious that you will want to continue straight on the singletrack. 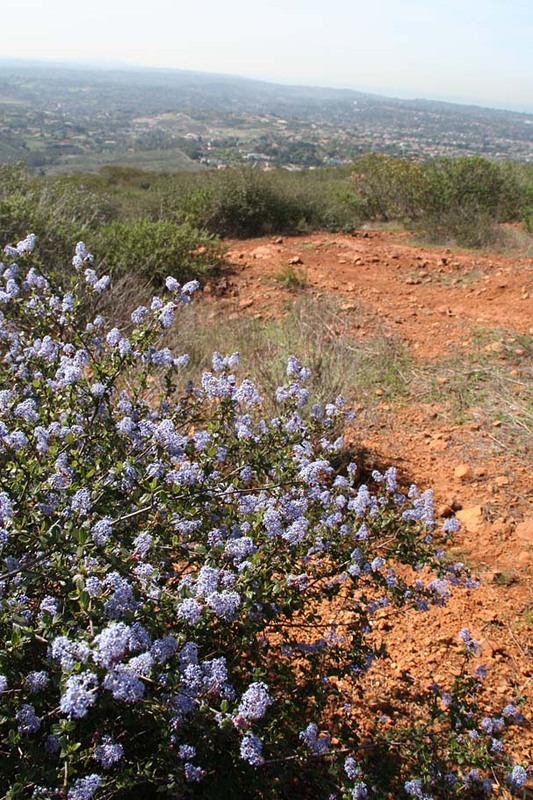 At the top of the switchbacks climb you will come out onto a fireroad. Immediately to your right is "NASCAR". Please take note of the unique sign here. 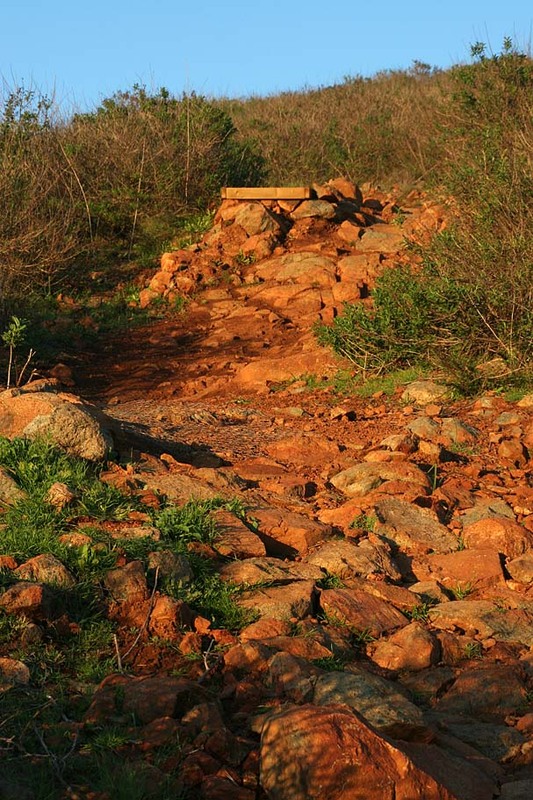 This a techncial trail that is steep and rocky with some jumps and small drops that will be challenging for an intermediate rider. It sheds off the elevation quite quickly and joins up with the Vista Del Mar trail at the bottom of the hill. For this loop climb up the fireroad to a kiosk at the top of the mountain. The kiosk was a gift/project from a local boy scout troop and they did an excellent job. However the craftsmanship of their work will mostly like not be what grabs your attention. According to the time of year and the typical marine layer, you can be treated to some exceptional views in all directions. 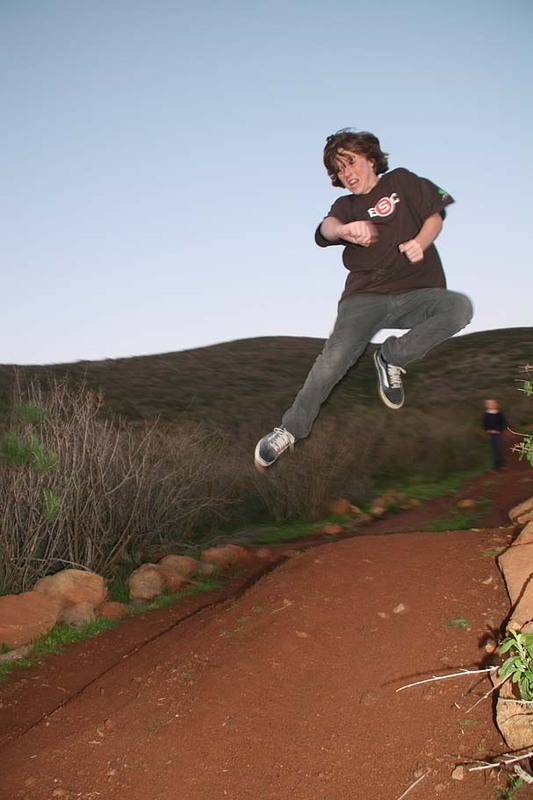 La Jolla, Downtown San Diego, Black Mountain, Catalina Island and San Clemente Island are just a handful of interesting spots you can pick out on clear days. 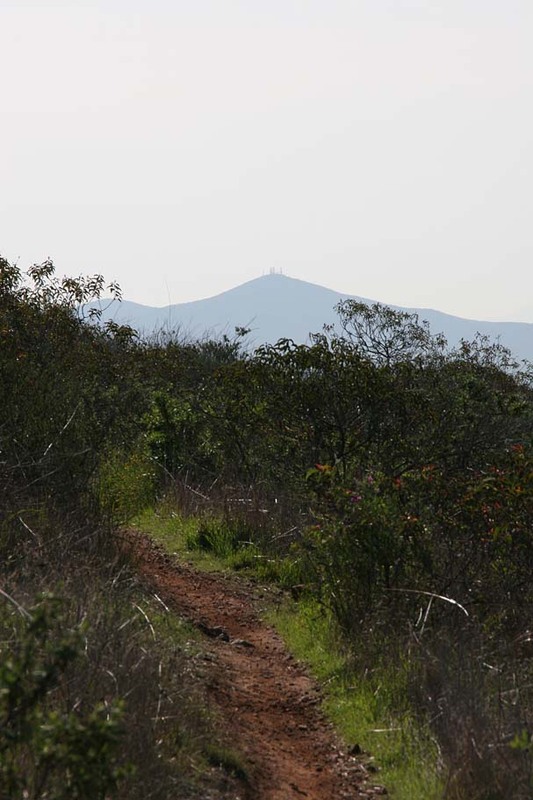 From the kiosk, look to southwest (towards Black Mountain with all the antennas on top) and pickup the old fireroad heading in that direction. 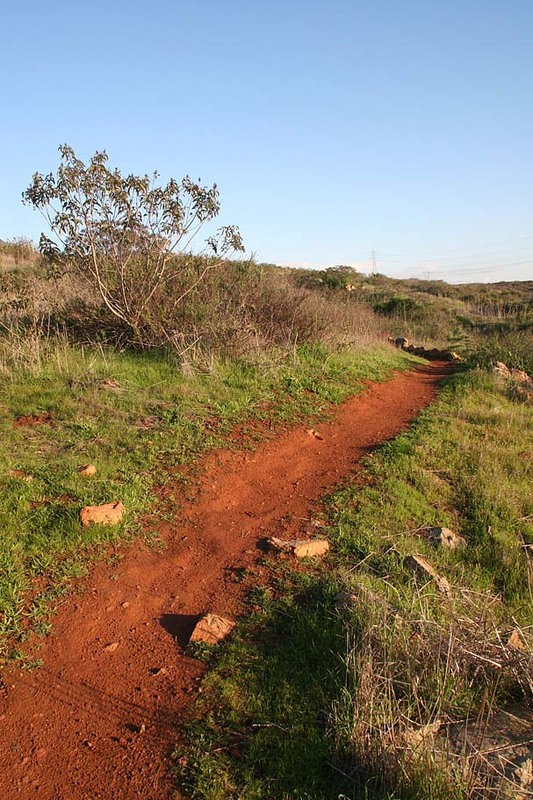 You will soon see a single track bearing off to the left, enjoy this nice flowy bit of trail on a gradual down slope. At the first singletrack intersection you come to go to your right. This trail mostly contours until it crosses over the old fireroad you were on earlier in the ride. After this point the trail steepens for a while before becoming much more gradual and flowing. 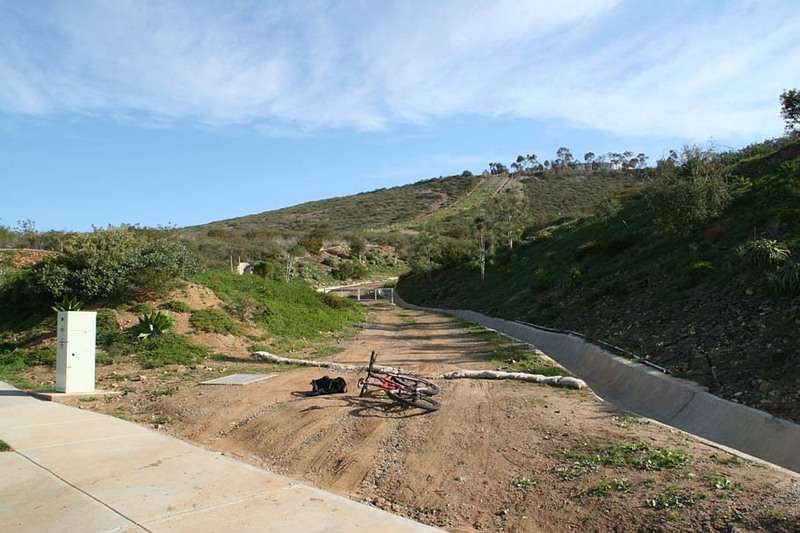 You will most like not even notice that you transitioned from the old steep trail to the new Vista Del Mar trail. 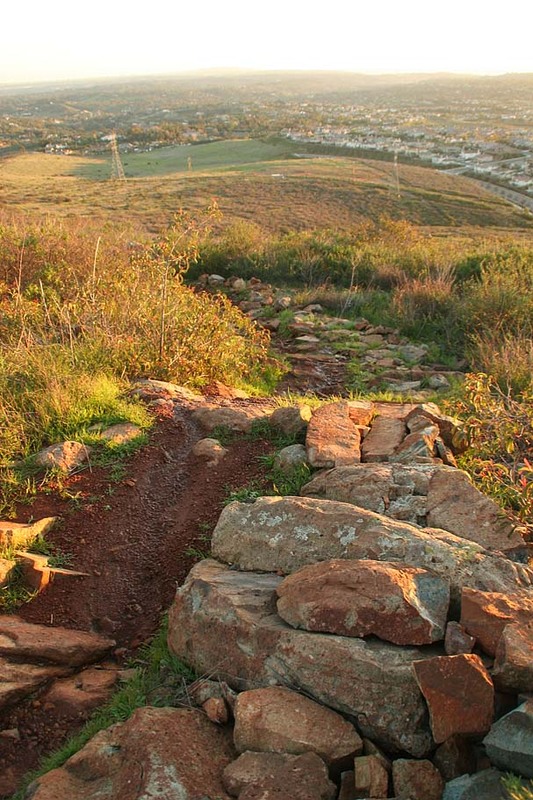 This trail is an exceptional singletrack that flows and switchbacks it way down the hill. 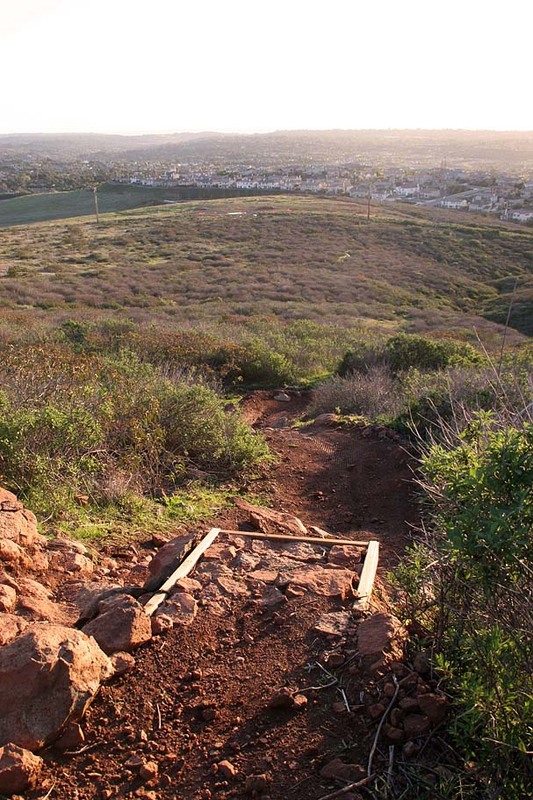 The Vista Del Mar trail is the brainchild of Rich Julien (SDMBA) who worked closely with the land managers (Center for Natural Land Management to approve, plan and build this trail. Rich personally built over 90 percent of the trail with the final push coming from a trail work day where around 40 volunteers deconstructed the old trail, replanted some flora and cut in the final section of the trail. You can see all the pictures and write up on that day here. Background information aside, this trail is really cool with some technical features here and there including an optional rock wall ride that will get most riders at least a little more than a little excited. Near the bottom of the hill you will come to a split in the trail where you will stay mostly straight (maybe a slight curve to the right) and keep flowing downhill. Next you will see a trail merging in from your right just as the trail you are on turns to the left. The trail merging in is the bottom of the NASCAR downhill trail. 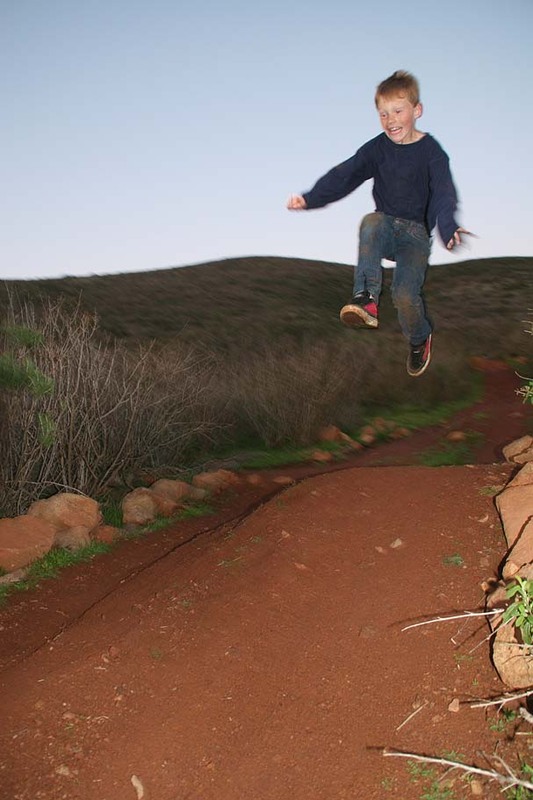 You will soon see a series of small double jumps before the trail starts going uphill. Just after the trail starts to turn uphill look for a singletrack off the right and take it. This next section includes some nice natural rock riding options before it comes out at the very end of an old chunk of pavement. There is a bermed turn here to the right so go with the flow to the right and you will come out into an interesting loop-de-loop turn. 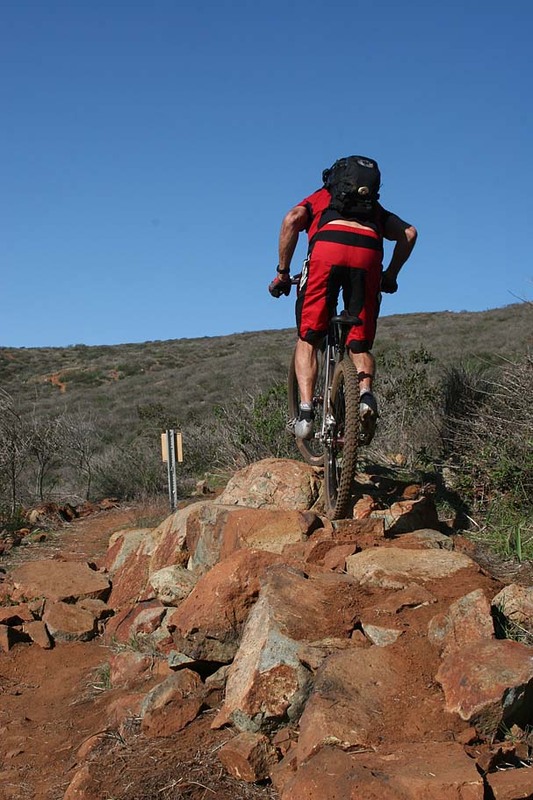 If you carry speed you will have a blast as you will pop up a little rise, roll down into left-hand bermed 180 degree turn and shoot back across the trail you just came in on. It is a really fun way to make a right turn. Shortly after this point you will have to deal with a rocky and fairly steep section of trail. After the rocky section, the trail mellows a bit and just as you can see the switchbacks trail that you started the ride on, you will pick up a single track off to your left. It is marked "To Sitio Salvia". This rolling bit of single track goodness is really flowy as it works its way back to the corner of Camino Juniper and Corte Romero where you started the ride. You will have done around five miles with this route so you may want to look at doing another lap. 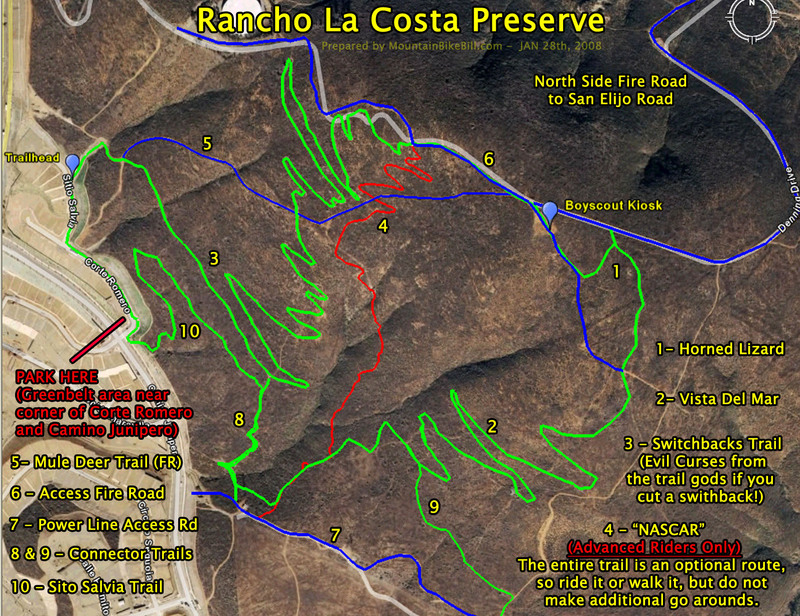 Another good loop option is go up the Vista Del Mar trail and down NASCAR (if you are into technical riding). The area is fairly small so with two laps and you will have pretty much figured the place out. Additional mileage: From the Kiosk at the top look due east to the two water towers atop the next hill/mountain over (Not shown on the map). You can go there by taking the service access fireroad down the northeast side of the mountain down toward San Ellijo Road. When the fireroad flattens out past a closed gate bear to your right on another fireroad and look for a singletrack off to your right heading east. 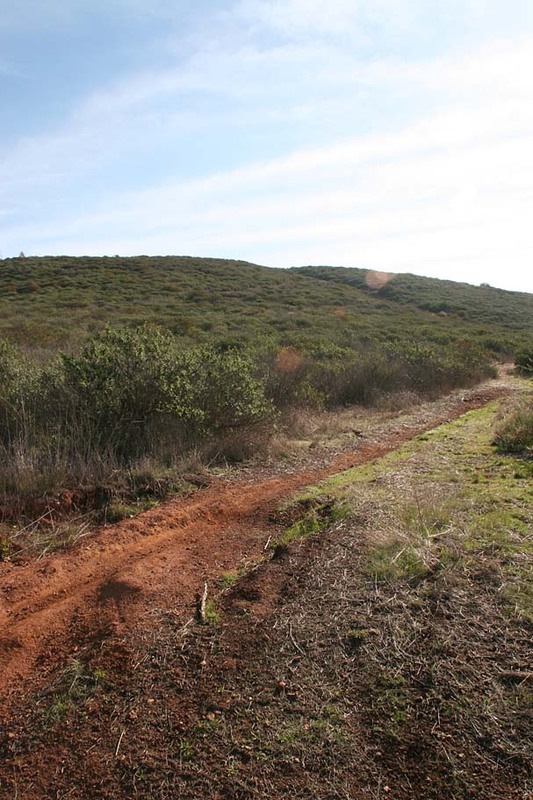 Take the singletrack and it will come out onto a service road near an old-landfill. Turn right and you will soon go around a locked gate. Notice that there is CNLM signage. Follow the service road on the slight downhill for about 1/4th of a mile. You will soon see an old fireroad going uphill and to your left. It is signed simply "trail" with an arrow. Go this way and climb your way up to the two water towers. This fireroad that is starting to narrow up is steep in a couple of spots but manageable. Once up to the towers retrace your route back the way you came. Adding this out and back adds enough mileage and gruntage to piece together a descent workout here. 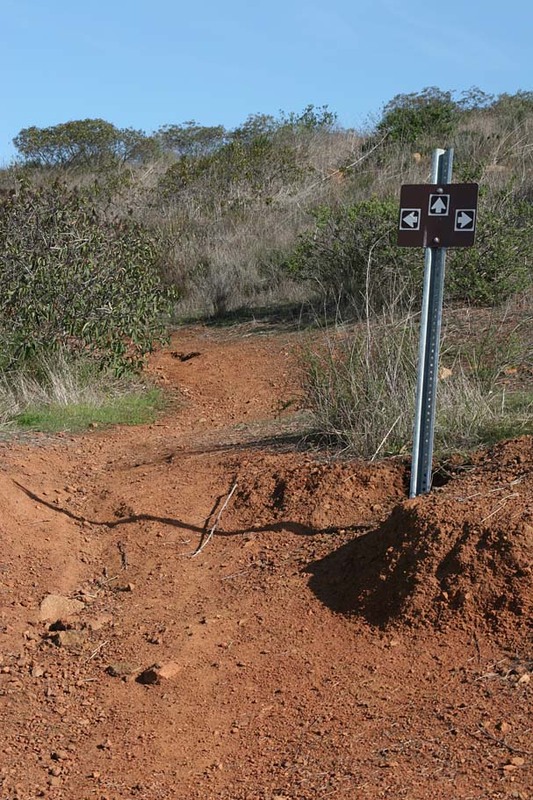 This out and back segment is part of a planned route to officially connect La Costa with Elfin Forest to the east which would make for some really substantial riding in Coastal North County. More to follow on that as things develop. While preparing this web page I realized that I did not have one single picture of the NASCAR downhill. Seems I never had the will power to stop during that descent to take pictures. Since I live about a 10 minute drive away, I grabbed the boys and went out to get some pictures. Near the bottom of NASCAR trail the boys were having fun running the doubles and working on their best "Air Bike" style. Will edged out his little bro with mad style points.